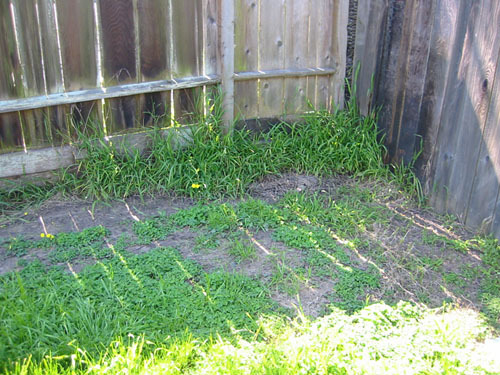 This morning I got started on the back shade garden, against the ugly awful fence. I decided to try out a new (to me) method of building a bed where instead of engaging in back-breaking weeding, double digging, and so forth, you simply mulch the hell out of the weeds. This is in the morning, and the sun is coming from the left side of the picture. 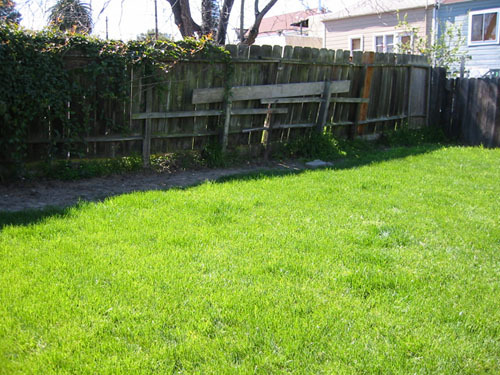 As you can see, there are parts of the yard that get no sun at all, because of that fence. Nice place for a shade garden. Here's a bit of a zoom in to the corner before I started working. Mostly weeds and bermuda grass, which is what I think will make this less than totally successful. Bermuda grass can grow through anything. I hate it. It is the only reason why I buy Roundup, because Roundup is the only thing that kills it. 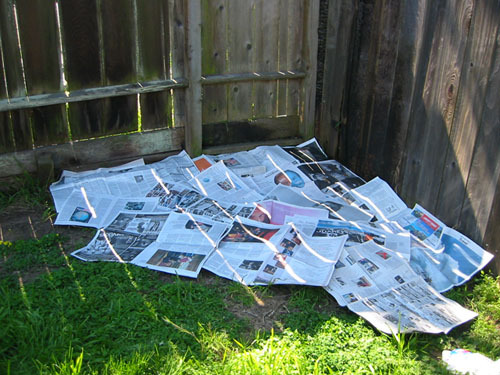 I laid out newspapers about two layers thick. For reference, this is one copy of the New York Times Western Sunday edition. I was trying one layer thick but even the slightest air movement made a mess of that. 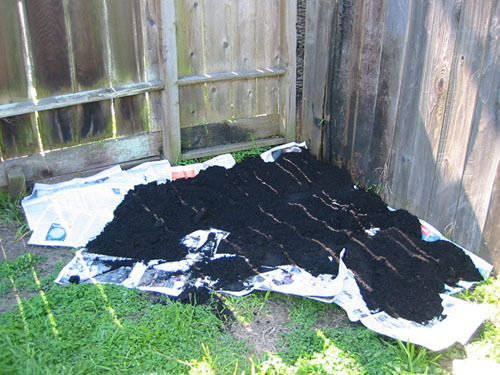 Then I spread compost on top, about 2-3 inches thick. In theory this gives you a weed blocker (the newspaper), then nutrition for your plant bed (the compost). I remain skeptical, but I also ran out of newspaper to lay down, so I will have to finish this bed tomorrow.